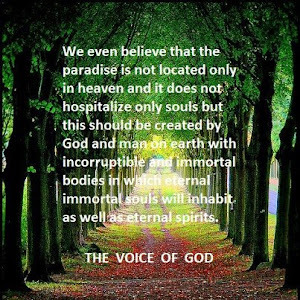 Voice of God: The call of God’s voice leads the man to reborn who brings up the redemption of the soul and the body doing the man incorruptible and immortal. Voice of God: All brothers who belong to the voice of God must know that God gave each man or nation specific forms of wisdom so that all have need of one another. Therefore we do not have to trade the wisdom of God or use it for exploitation and victimisation to one another. Voice of God: No one who belongs to voice of God must be looking outside of himself. All things are in us and we must be looking for God inside us. 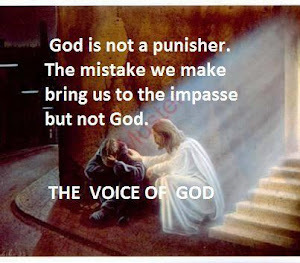 Voice of God: Spreading the voice of God we confront many difficulties which come up from the material factor. 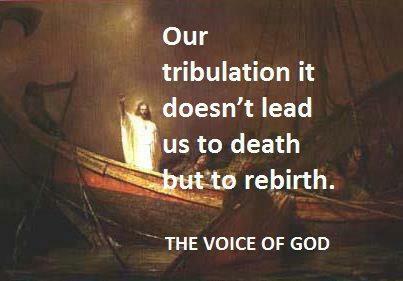 I wish all of us to contribute to the spread of the voice of God helping spiritually and materialistically. Let’s remember for those who have in abundance to give to those who lack. The poor widow put out of her poverty all that she had because she considered that the needs of the temple where more valuable than hers. Voice of God: To perceive all the obstacles that impede to my spiritual life and with all my power to go forward for the rebirth into Godliness. Therefore man and people of God must move freely aiming to the target, the will of God is to overshadow the entire planet. The wish of the voice of God is all men to acknowledge the gospel of the kingdom and the fruits of the Holy Spirit to inundate the life of all those who have listen. I wish, to all of our brothers and sisters of the voice of God, to receive these fruits of the Holy Spirit. Voice of God: Faith to Jesus and to His gospel so that all to enjoy the incorruptible life and the freedom of God’s spirit. Voice of God: Awareness is needed for all brothers of God’s voice to avoid the spiritual pitfalls which are Lusiferian egoism. Voice of God: Is ready to hug all those who want to accept the truth in their life and this truth will become a habit in the daily routine and then comes sanctification. Voice of God: To all of us who belong to the voice of God judgment coming from people will not affect us because what concerns us is the judgment of God. Voice of God: Does not abolish the law of God does not abolish the living faith both are needed to work with, the target is to be reborn to be cultivated to alter life to be changed to a new man according to God (to the image of His). This man is governed by the principles and the law of God, also the law of God includes the wisdom and the living faith possessing this we can perform miracles. Voice of God: All brothers have the call from heaven to work spiritually using the great mercy and the living faith, which increases with the deeds of sacrifice, so that the law of God will secure salvation of the soul and the body. Voice of God: Is striving so that all men to be informed of the gospel, the gospel of the kingdom, for all to become one flock with one Sheppard Jesus and for the fulfillment of all promises of the Old and New Testament in the name of Christ. Voice of God: And who lives and believes in Me shall never die. Do you believe this? John: 11:26. We believe this and we work on it so that the law to become a way of living and the living faith to guard our life. Voice of God: Has the destiny to give the gospel of God to all men on earth, the spirit of God has the capability to elaborate upon the word of God, preaching the gospel of the kingdom. This gospel is unique because it abolishes the physical death and establishes the kingdom of God in us and around us. The wisdom of men which for me is comments and speeches will be replaced by the only truth the hidden truth of Christ’s gospel. Paul in his second letter to Timothy reveals: but it has been revealed by the appearing of our Savior Christ Jesus, who abolished death and brought life and immortality to light through the gospel. Voice of God: For the brothers who belong to the voice of God gave to do a sacrifice of love, but not to exceed the limit not to jeopardize life, beyond this point we have to trust God. For those who always demand and they are never satisfied God has another plan. Voice of God; is the establishment that all of us are serving, preaching the gospel of the kingdom. This gospel of the kingdom has the highest heavenly call by God and it is addressed to every man on earth to every nation. And this Gospel of the kingdom shall be preached in the whole world for a witness to all nations and then shall the end come. Math: 24:14. 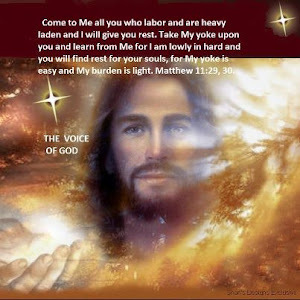 Voice of God: The boasting is in Christ our God. The reason we have joy is because Jesus is our benefactor. Although all of us were sentenced to death, from our mistakes from our ignorance from our sins, Jesus came paid the price we owed to the court and gifted life to us. He gave to us not an ordinary life but eternal life, in quality full of the spirit of God, in quantity full of unlimited time full of God’s wisdom. After all these (as voice of God) we preach Jesus Christ to all nations. 1) To abolish the sin in us and around us. 2) To establish the kingdom of God in us and around us. 3) To abolish the actions (sins) that destroy life, actually we will re-establish the incorruptible life that God offers to us, to become according to His image and to His likeness. When we reach this point the rest of His promises will be fulfilled like the second coming of the Lord and many others which will change the planet creating the family of God in the whole universe where the light exists in the space and out of the space. Voice of God: Through the dedication, as voice of God, we work today with God’s power to apply the law and then by the living faith to restore life with all the incorruptible elements. The eternal incorruptible immortal life will reign again. The primordial behavior and operation that God from the beginning gave to man will be restored to us. Voice of God: The voice of God has cared for the brothers as essential nourishment the word of God New Testament, where by everyone may legislate for himself of this. In addition God gave a big and beautiful spiritual property full of God’s wisdom which is increasing every day. It is free to everybody. Then by study to perceive the events of the gospel improve the will of God and meliorate our life. Voice of God: Has started a spiritual property where it reveals the way that sin is working, also provides the way to avoid it. If we want to approach God, we have to know that, with our will and our effort will be succeeded. Voice of God: Has the freedom of the spirit and gives freely to all those with good intention the way to strive against the sin the decay and the death. Voice of God: Today, the voice of God with all its children is struggling not to lose the ownership of life and is applying the law of God also makes good use of His mercy, mercy persecutes us every moment. As it is written in the day you sin in the same day you repent. Voice of God: Has the basic elements to create again God’s people God’s family. Voice of God: Will contribute to, especially to the Christian society, the appearance of the children of God regardless the dogmas tribes or nations. These children today are scattered all over the earth, striving the spiritual rebirth having part of the truth and of other spiritual elements. Voice of God: Does not have the mission to create another dogma another cult or a new organization but to fulfill the missing parts of the spiritual sciences. Today the world of science, in every field, determines the fate of the people, regardless of the spiritual level. The voice of God will redefine the goals and pursuits for the rebirth of all Christian society so that the unity will be achieved among men at a universal level. This unity is an issue of the gospel. Jesus said: But this all will know that you are my disciples, if you have love for one another. John. 14:35. Voice of God: Through structural changes, under the spirit of the gospel, will restore, for those they have destiny, the elements that makes life incorruptible. Also changes will effect, at gene level, the living faith and eternal life all the sons and daughters of God. It is certain these children of God will liberate the creation from the present corruption, through the repentance and reborn, prerequisite the living faith to liberate ourselves from the sin, from passion, from egoism the existing stereotypes that make us enemies, culminating always human liberation from decay and death. Voice of God: Rebirth into Godliness through repentance study and prayer. Through the dedication and devotion to the will of God I will deify myself it is written: You are Gods and all of you are children of the most High. Psalm: 82:6. I have to eliminate, with the relevant spiritual effort, any obstacle or weakness, from the spiritual or material field, that could put me into spiritual servitude. The pursuit and the will of God is the sanctification. The spiritual fall is allowed, the stay (in fall) is prohibited. Forgive myself but forgive my fellowman continually. I have to respect the religion or dogma of every man regardless the nation or tribe, because God is not religion God is love. Everybody accepts love and love accepts us as we are. Love finds ways and invents systems for salvation. As a Christian I have to be united with other people, this is written in the word of God. In the gospel there are many substantial spiritual elements and many common targets that all Christians should have, like unfeigned love, living faith, humbleness, righteousness, brotherliness. In the case that someone insists on me to adopt his dogma then it is better for me to keep a distance, because he does not respect God and the different mission, inspirited by God to me to believe it and achieve it. From today, to present my body, logic, pleasant worship to God so that serves God and man. It is wise not to be possessed by strict conscience and it is clever not to judge or condemn people. With strict conscience judgement is always wrong, without mercy I put myself in trouble. I have to use the material for God’s glory and for the rebirth into Godliness of my fellowmen. God loves a cheerful giver. The root of all evil is avarice (the love of money). I would not seek to become spiritual leader or teacher or shepherd or prophet or president or deacon, it is egoistic even to think it. These titles are technically possessed variously and artistically appeared on those who judge who threaten who scare who deprive the freedom and reconciliation of his brother although they both belong to same dogma. But you do not be called “Rabbi”; for One is Your Teacher the Christ and you are all brothers. Do not call anyone on earth your Father for One is your Father, He who is in heaven. And do not be called teachers, for one is your Teacher, the Christ. But he who is greater among you shall be your servant. And whoever exalts himself will be humbled and he who humbles himself will be exalted. Math: 23:8-12. Let’s have one principle through love and noble emulation to complete each other the spiritual shortage, of course everything by the free will. I must have unease spiritual activities like study and prayer. These will insure an imaginary paradise and I will achieve my re-entrance to incorruptible life. Avowal will be given if they asked me; impertinence is a form of egoism. Practically for those I will bring to Christ they will tire me but those Christ will bring around me they will comfort me. Once and forever I must understand that the church of Philadelphia will be created in the end of times in which we are today. For the church of Philadelphia its main participants will be reborn Christians from every dogma and nation having all understand that man’s enemy is not our fellowman but sin corruption death. Practically we will understand that we do not wrestle against flesh and blood but against principalities against powers against the rulers of the darkness of this age, then we will defeat our bad evil self and we will become friends and brothers (children of God). Let be done, let be done. AMEN. Αναρτήθηκε από NIKOS στις 10:39 π.μ.